We demonstrate how the card game from Tutorial #03: Card Game can be created solely with Lua. For this tutorial it is assumed that the reader already has basic knowledge about Lua programming. You need to add the optional Lua add-on to your project in order to be able to use Lua scripts. The easiest way to configure add-ons is by using the Murl Dashboard and the command Project / Configure Project. We use a copy of the resources game.murlres from tutorial #03. Additionally we add script resources to the package and store them in a separate lua folder. The script resources have to be added to the package like any other resource file. The resource lua_card_game_logic is instantiated with <Instance scriptResourceId="lua_card_game_logic"/>. This means that the script automatically will be added as a logic processer after the package has been loaded and is processed like any other logic processor. 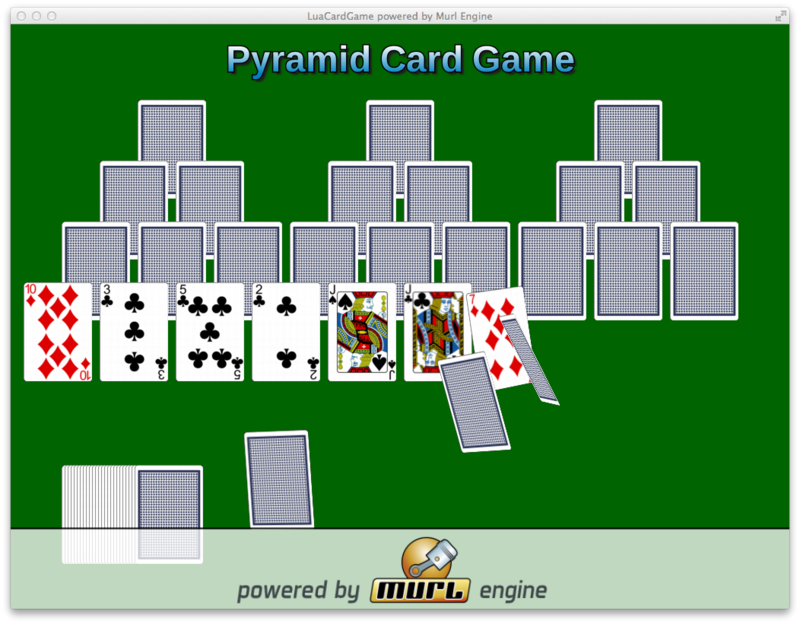 The second script resource lua_card_game_card_instance is used as a script controller of a graph node. Thus for every card graph instance also a lua_card_game_card_instance script instance is created. After a graph node has been initialized the corresponding controller script is processed on every logic tick. A pure Lua application uses a small portion of generic C++ code to initially load the first Lua script. This script has to implement the IApp class in Lua and needs to be stored in the packages folder. Hint: A pure Lua application with all necessary code parts can easily be created with the Murl Dashboard by using the Create Project command and the Lua template. The program flow is almost identical to the C++ program from tutorial #03. This script is loaded and executed immediately when the program starts. The script has to return a IApp object. In the first section (line 4) Lua standard libraries are loaded. In the second section (line 11) the parameters are evaluated. The Lua application script gets exactly one parameter containing the name of the script resource. In the third section (line 15) a Lua function table is created. These functions act as callback functions and have the same meaning as the equally named C++ IApp methods. In the last section (line 92) an instance of the IApp class with the callback function table is created and returned. Afterwards the Lua callback functions in mainIApp are executed like otherwise the equally named C++ methods. The function Configure() (line 17) contains the same program as the C++ method in card_game_app.cpp from tutorial #03. The same applies for the function Init() (line 75) which loads the resource packages. Lua programming syntactically slightly differs from C++ programming but almost all Murl classes are mapped to equally named Lua tables. A complete documentation of all Lua tables can be found in the download section in the MurlEngineLuaAPI archive. Our game has 54 card instances where each can be controlled separately. To keep it simple we implement a script which can control exactly one card. This script is used as a graph node controller as shown above in the sub graph graph_game_card.xml. This script is automatically created and processed when the corresponding graph node is loaded. The script should return a Logic.IAppGraph object. In the first section (line 4) the Lua parameters are evaluated. The Lua controller script gets exactly two parameters. The first parameter is the name (id) of the script resource and the second parameter is the name (id) of the controller node. In the second section (line 8) a lua function table is created. This functions act as callback functions and have the same meaning as the equally named C++ Logic::IAppGraph methods. In the third section (line 175) the function table is added to a global table mCards to allow the logic code to access the individual card instances. The functions and variables of the logic.IAppGraph table correspond to the methods and member variables of the card_game_card_instance.cpp from Tutorial #03. The logic processor instance is instantiated directly in the package.xml as already shown above. This script is automatically loaded and processed when the corresponding resource package is loaded. The script should return an instance of the Logic.IAppProcessor class. In the first section (line 4) the parameters are evaluated. The Lua script gets exactly two parameters. The first parameter is the name of the script resource and the second parameter is the replication number. In the second section (line 14) a Lua function table is created. The functions act as callback functions and have the same meaning as the equally named C++ methods of the Logic::IAppProcessor class. Finally (line 364) an instance of the Logic.IAppProcessor class is created and returned. The functions and variables of the logicIAppProcessor table correspond to the methods and member variables of the card_game_logic.cpp from Tutorial #03. The most obvious difference between the Lua implementation and the C++ implementation is the creation and initialization of the card instances, which in the Lua implementation occur automatically when the graph nodes are created.